What's for Lunch, Papa Penguin? Papa Penguin and Pippin run the best cafe in the Antarctic, serving fish for breakfast, fish for lunch, fish for dinner, and even... fish ice cream! Everyone loves fish. Or do they? Ideal for fussy eaters, this is a hilarious picture book about a penguin chef's chaotic roadtrip a... read full description below. Papa Penguin and Pippin run the best cafe in the Antarctic, serving fish for breakfast, fish for lunch, fish for dinner, and even... fish ice cream! Everyone loves fish. Or do they? 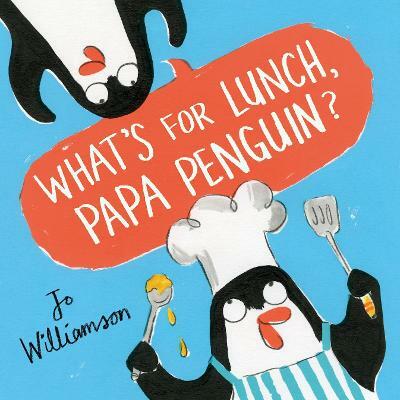 Ideal for fussy eaters, this is a hilarious picture book about a penguin chef's chaotic roadtrip around the world in search of new exciting foods to try. A perfect picture book celebrating food and the joy of cooking by the very talented printmaker, Jo Williamson.